My First Doodle Recipe - A Rose Is A Rose Is A Rose! 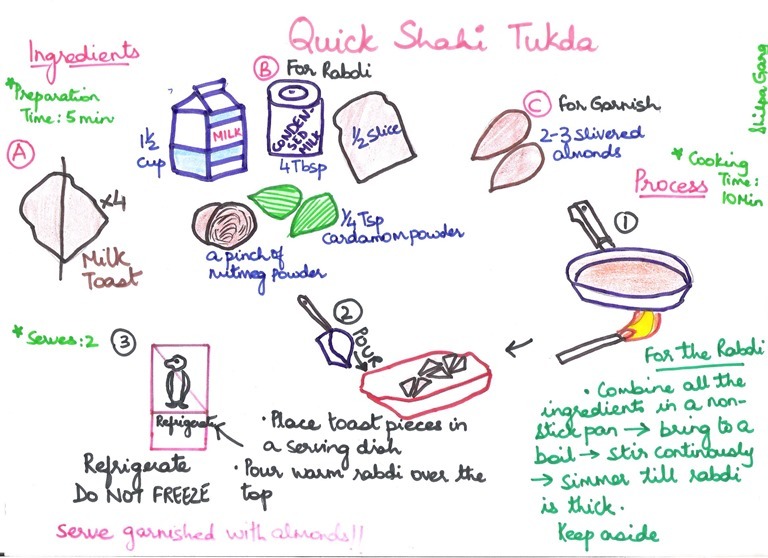 Here’s a recipe narrated by the resident Master Chef KG and doodled by an amateur ‘artist’ me! I must admit that your handwriting is slightly better than mine 🙂 Doodle is easy to understand and tempts me to implement, but with my disastrous kitchen results, I am sure I’ll mess it up 😛 Why is the description starting from left, though? Good One! Will try it out some time! Amateur? has dictionary meaning been redefined.?! You seems to be a professional artist. Super recipe. KG is an excellent chef. But you are an excellent artist and narrator. Hey you tried your hand at this.. great. I still haven’t got around to it… doodle recipes sound so interesting, na? You’ve done it like a pro. You must!! It is simple and can be made in 10 minutes! Shilpa, you are really creative. You have the technique and expertise to bring out something very interesting. 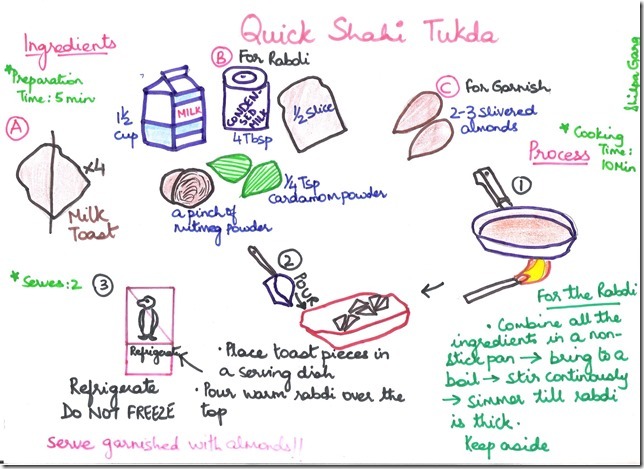 The age old Shahi Tukda has donned a new look. Kudos. I loved the flame under the pan 😀 Verrry creative! Awww!! so very well done. Its been a while I have made this at home. Reminds me that Diwali is round the corner and I can definitely add this on the menu.